Having previously reviewed the EcoAir DD122FW Dehumidifier I thought that it would be interesting to compare the DD122FW to the DD122MK5 which in turn provides a great review of the EcoAir DD122 MK5 dehumidifier in itself. For starters you should know that the DD122 MK5 is more expensive than the DD122FW (approx £170 to £140). However the higher price for the DD122 MK5 is justified by a larger number of features that this EcoAir dehumidifier contains. First we will list the pros and cons of the EcoAir MK5 and then we will compare each EcoAir unit in bullet point form for easy comparison. We will follow this by an extensive written review so that you know exactly what you are buying. Safety Features Include Tilt Over Protection, Water Full Indicator And Automatic Water Full Shut Down. 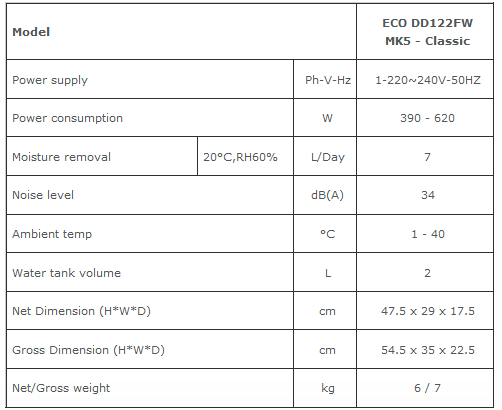 Like the EcoAir Eco DD122FW the DD122 MK5 has a daily extraction rate of 7 litres. Of course the extraction rate will depend on the moisture level of the environment. Initially when forst using either dehumidifier you should run the machine on a powerful setting to bring the relative humidity (RH) levels down to 55%. During this time you will find that your dehumidifier will extract at its highest rate. Once the RH is down to 55% you can set the dehumidifier to maintain this level of RH. The unit will then extract less water than previously. Testing for these units was done in a temperature of around 30°C with 80% RH so your actually extraction rate will probably fall below the 7 litres per day capacity. The tank features of both appliances are the same with the tank holding 2 litres of water, featuring an auto shut-down system when the tank is full and a red light indication when the tank is full. Both units feature an anti-bacterial filter and it is important to note that usually domestic dehumidifiers in the EcoAir DD122FW price range feature a standard dust filter so that makes the DD122FW very good value for its price. The anti-bacterial filter of the EcoAir DD122 MK5 combined with the ioniser ensures that the air comes out very clean which is important to allergy and asthma sufferers. The ioniser decreases the number of dust mites, mould spores and other allergens in the air thus making breathing much more comfortable for allergy sufferers. EcoAir introduced E7 Technology into its dehumidifiers in 2012. Eco E7 Technology features a auto toggle function which has multiple algorithms operating in parallel to manage power, temperature and humidity. In lay terms this means that the dehumidifier scans the surrounding air for temperature and humidity levels. The machine can then switch ‘on’ and ‘off’ between its different operating modes such as full power, economy power and standby modes in order to keep the humidity in the area at the pre-set level. This technology saves the end user quite a lot of money in running costs as the dehumidifier is not running 24 hours per day in settings which are too high. Reports say that you can save up to 40% in your electricity bills when using this particular EcoAir dehumidifier. Several other EcoAir dehumidifiers use Eco E7 Technology as well however the EcoAir Eco DD122FW does not. The MK5 also features overdry protection. When using the EcoAir DD122 MK5 on high power or laundry mode for long periods of time the air can become very dry. The DD122 MK5 knows when to toggle the dehumidification process once the machine detects this. The 3D louvre channels air into the direction you want which is especially helpful for drying clothes, getting rid of tough mould, drying paint etc. You can use the wide channel for even air distribution and the spot channel to pinpoint a particular area such as mould on a wall or a clothes horse. EcoAir have upgraded the heating element design for the DD122MK5 from the DD122FW for a more even airflow which complements the auto toggle function. Like the DD122FW, the EcoAir DD122 MK5 operates at 34dBA on its lowest setting. How loud is 34 dBA? A noise of a bedroom at night is about 30dBA so 34dBA is just a little louder than that. In other words 34dBA is very quiet. Both the DD122FW and DD122_MK5 come with a 2 year warranty. Extended warranties are available for the domestic EcoAir range and come on top of the 2 year warranty stated above. These prices include 20% VAT. The Ecoair DD122 MK5 contains a lot of features and is perfect for those with allergies, asthma and other respiratory problems as well as those who want to dry washing inside without using a tumble dryer. Of course the DD122 MK5 dehumidifier is also great for keeping mould at bay and condensatio of your windows. The EcoAir DD122 MK5 is ideal for a 2-4 bedroomed house, flat or apartment and small office use. Verified reviewers on Amazon.co.uk, where the dehumidifier rates 4.6 / 5 stars from nearly 800 reviews, are very enthusiastic about the DD122 MK5. Did you enjoy this EcoAir dehumidifier review? Let us know your thoughts in the comments below.